Former SBCISD English teacher and coach Yvette Perez posing with her medal after her participation at the 2018 Ochsner Ironman. San Benito native Yvette Perez has been a fitness fanatic and competitive runner for more than a decade. 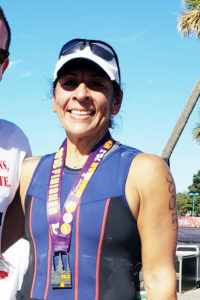 On October 21st, Perez competed in the 2018 Ochsner 70.3 Ironman triathlon in New Orleans, Louisiana. The Ironman triathlon is one of the biggest and most punishing tests of physical endurance. The competition is comprised of a 56 mile bike ride, a 13.1 mile run, and a 1.2 mile swim in Lake Pontchartrain. This Ironman competition takes place every year at various locations across the globe, where some of the best athletes compete for first place, testing their limits. Out of 939 competitors, including men and women, Perez placed 741st. Out of 298 women, Perez placed 210th, and out of 35 women ages 50-54, she placed 18th. A few years ago, Perez qualified for and ran in the impressive Boston Marathon, something that is nearly every competitive runner’s dream. Perez was a beloved coach at Berta Cabaza Middle School for many years. She now resides in Alabama where she is a personal trainer at her local Young Men’s Christian Association (YMCA). At 50 years old, she continues to participate in local marathons and works out every single day as a part of her normal routine. She says she continues to strive for personal fitness and motivation.